Even though they’re labelled as thrash metal (including by themselves), WEB have always been more than that. More than ever, “Everything Ends” justifies both whys – why thrash metal and why “more than that”. WEB had already courted the doom genre in their previous work “Deviance”, with the track “Mortal Soul”. But in “Everything Ends” the band strengthens that courtship, right off on the opening track. Grave and intense, “Vendetta” plays out slow, growing gradual speed more or less halfway and leading to a fast and rich guitar solo. A thrash metal solo, we may call it. That solo merges with the original and predominant sound of the song, becoming “that” little detail that challenges all rules. Both parts of the title-track aren’t 100% pure doom either. Once again, the diverse guitar work gives them such a life that wouldn’t be expected in songs of this nature. Yes, “surprising” is a good word to describe “Everything Ends – part I & II”, also due to their length, of almost 17 minutes! Again mentioning “Deviance”, it is true that “Journey” goes beyond the ten-mark. But seventeen minutes is another level of boldness, even if divided by an acoustic interlude (made of chords that are played, in electric guitar, throughout the second part). A new level successfully achieved, since it doesn’t get boring. The weight of “Death My Enemy” is closer to death metal than the doom I’ve talked about so far. Reason why WEB invited Nuno Lima (DEMENTIA 13) so his growls could intensify that “death metal” idea. As for the melancholy in “New Beginning”, that is better identified with the old school gothic metal, à la PARADISE LOST. “Leaving Scars” also features a special guest, this time Miguel Inglês of EQUALEFT. The track is as eclectic as its guest, resulting in something aggressive but groovy. And so it’s in “God Of Nothing”, “False Prophets”, “All Turns To Dust” and “Taking The World” that lie the most glaring evidence of the thrash that runs in WEB‘s veins. If the rest of the album bears them, mingled with other genres, these four tracks leave no doubt about their destructive roots – somewhat melodic in the first, much rawer in the last. 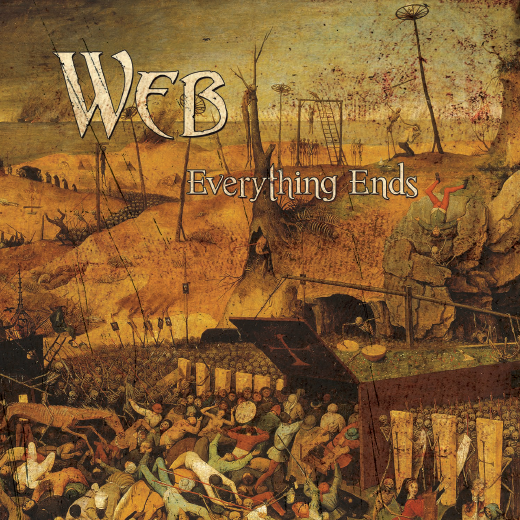 “Everything ends” and, eventually, so will WEB‘s creativity. But I can assure you that this album release doesn’t mark that day. At all. This entry was posted in CD reviews and tagged album, doom, everything ends, Portuguese metal, raising legends, review, thrash metal, Web. Bookmark the permalink.